Discussion paper on the ethics of dancer’s health and dance communities in general, presented at the Healthy Dancer Conference in Québec City, November 2015. In the space and time of this twenty-minute presentation I will look closely some of the fundamental social and philosophical premises of our current-day artistic dance practices and dance worlds. And so I will offer vital questions about the ethics and ethno-histories of professional (artistic) dance, as well as some initial responses, with the intention of furthering local and global conversations about these issues. To begin envisioning a future of healthier dancers — healthy in body, mind and “spirit” – let’s look at some of the recent significant shifts in dancer’s training and choreographic practices in the light of a globalizing, postmodern dance world. Chapter commissioned by Allana Lindgren and Kaija Pepper, editors, for Renegade Bodies: Canadian Dance in the 1970s, published by Dance Collection Danse Press/es in 2012. By the 1970s the island of Montréal counted four universities. There was an old-and-reputable one and another newly established and less traditional one for each of its two predominant linguistic groups. All of them – the universities of McGill and Concordia on the English Canadian side, Université de Montréal (UdeM) and Université de Québec à Montréal (UQAM) for the Francophones – already housed dance activities. These activities took diverse forms, from adjunct courses for physical education majors at the UdeM to student dance clubs like the one founded by Thelma Wagner at McGill University. And because of the particular socio-historical situation of Québécois society, dance programmes appeared later among Francophones (in the 1960s) than within the Anglophone and allophone communities (in the 1930s). But the notion of dance as an academic field of study in its own right, “modern educational dance” as Laban called it, is quite a recent phenomenon in Montréal. Published in Dance Connection and Contact Quarterly magazine summer 1992 and as a chapter in a book of essays Les Vendredis du Corps edited by Aline Gélinas (in French, Éditions Jeu/Parachute); revised for Canadian Dance Studies 2 (published at York University) in December 1996. Paper written in 1999 during PhD studies, then presented as a conference paper at the 1999 conference organized by the Festival international de nouvelle danse, and published in book form in: Davida, Dena. (2001). Kealiihonomoku’s legacy: the postmodern dance event. In Chantal Pontbriand, ed., Dance: Distinct Language and Cross-Cultural Influences. Conference proceedings, held in Montréal from September 30 to October 2, 1999. Montréal: Éditions Parachute. 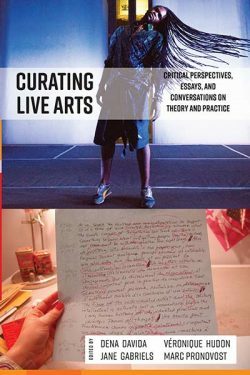 Conceived in the aftermath of a seminar which provided an intense immersion into the philosophical debates permeating occidental arts and cultures, this paper explores a crucial methodological element of my doctoral dance ethnography-in-progress: the dance event framework. This concept emerged in the 1970s in the writings and teachings of Euro-American dance anthropologists to facilitate the study of non-art dances, the so-called “ethnic”, “folk” and “social” dances. Discussion of Western art dances have been traditionally the exclusive province of critics, historians and philosophers. What happens when this dance event framework is employed in a study of postmodern art dance? Do new understandings emerge when these art dances are reconsidered as social and cultural practices? Version écrite d’un texte d’une conférence prononcée lors de Parcours danse, un événement organisé par La danse sur les routes du Québec le 22 novembre 2008 à Montréal. First draft of text prepared for the Liberté journal, English version but published in French, August 2001. In cosmopolitan urban environments like Montreal almost everyone dances somewhere at sometime. There are hundreds of dance event genres and occasions for dancing, each requiring a particular kind of dancing and dance-watching. Amid the sport, folk and social dance enthusiasts can found a (much) smaller group of “art” dancers for whom dancing is a full-time vocation. Unlike their part-time dancing cohorts, the dances of these vocational aesthetic-minded dancers are not (principally) a matter of health, sport, play, cultural identity or socialization. But this art dancing seems to have a less tanglible, perhaps less practical aim: they are busy producing “aesthetic experiences” for audiences. Among the art dancers a certain subgroup of innovative individuals make claim to a genre called “contemporary dance” in which the movement style, form and purpose is literally reinvented with each choreographic project. Chaque semaine dans des dizaines de villes composant un réseau international, des membres de cette «communauté d’expérience», de contact improvisation se retrouvent pendant quelques heures dans un studio de danse pour un jam. Cette pratique hybride me semble fonctionner à mi-chemin entre une méditation corporelle, une thérapie psycho-kinesthésique, un entraînement sportif, et une séance d’improvisation dansée. Interview with Jeanne Renaud on April 2, 1997 at her home in Montreal. That’s why I left my company [Le Groupe de la Place Royale]. It’s because I was going somewhere else, had gone as far as I could with the kind of work that I was doing. I was questioning everything. I was afraid that if I didn’t, that I would develop a system, because I knew how, in my abstract forms, to cut things up and put them together again. I had developed a way of working with form, shape, space, rhythm and energy. It’s like the couturier who learns how to cut on the bias [of the cloth], she makes something so beautiful that it can become too comfortable. I had explored as much as I could, and didn’t have the challenge any more that I was looking for in my creative work. So I broke away completely and started again from “rags”. Ils sont prolifiques et ils attendent leur tour avec impatience. Presque imperceptible encore aux yeux du public, un groupe dynamique de jeunes créateurs amène une deuxième vague d’expérimentation en danse à Montréal, et ce, dans la même décennie. Parmi les plus prometteurs et les plus productifs figurent: Carole Bergeron, Hélène Blackburn, le collectif Brouhaha, Martha Carter, Danièle Desnoyers, Florence Figols, Lynda Gaudreau, Nathalie Lamarche, Hélène Langevin, Danièle Lecourtois, Jane Mappin, Suzanne Miller, Irène Stamou, Isabelle Van Grimde et Pierre-Paul Savoie. Presque toutes des femmes, à l’exception de ce dernier, elles ont reçu une formation universitaire (du moins académique) en danse contemporaine et comptent à leur actif cinq à dix ans de pratique. D’une trentaine d’années, elles sont parmi les plus déterminées de cette génération montante. Paper presented at the annual conference “Renegade Bodies: Dance in Canada in the 1970s” of the Canadian Society for Dance Studies in Ottawa, 2010.